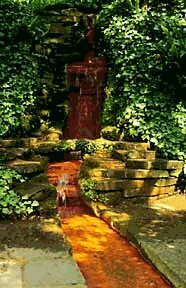 The Chalice Well lies in a protected area of natural beauty, at the foot of a narrow valley running between the Tor and Chalice Hill and is an integral part of the sacred landscape in and around Glastonbury. For over two thousand years the Red Spring, or Blood Spring, has flowed ceaselessly and is a place where people have gathered to drink the waters and find solace, peace and inspiration. In 1959 Wellesley Tudor Pole, a man of vision and insight, secured the Well and surrounding land for the future, creating the Chalice Well Trust. His intention was to preserve the whole area as a sacred site to ‘encourage individual spiritual evolution by offering this place to members of the public, of whatever religious persuasion or none, for pilgrimage, quiet contemplation and healing’. There are many legends associated with this holy site. Not least among these is that the waters represent the blood of Christ miraculously springing forth from the ground when Joseph of Arimathea buried or washed the cup used at the Last Supper. 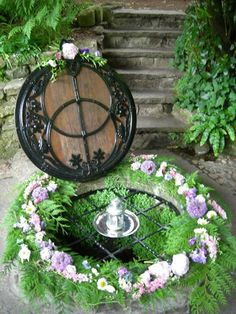 For others the waters are acknowledged as the essence of life, the gift from Mother Earth to sustain its living forms and so a continuous spring like Chalice Well is a direct expression of an unbounded life force. The gardens that surround the Well are a beautiful place to experience the tranquillity and peace of this ancient sanctuary. There is a distinct numinous and healing quality in the atmosphere, where many traditions; Druidic, Christian, Pagan and Goddess have gathered over the centuries. Earlier in the twentieth century the archaeologist Bligh Bond designed and gifted the wellhead cover. It depicts the Vesica Piscis, an ancient sacred symbol of transformation. (See also Vesica Piscis). This profound symbol is visible in several places in the gardens and reminds us of the duality of existence and the quest for unity. This is echoed in the surrounding landscape of the Tor and Chalice Hill. 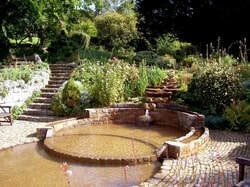 The red waters flow through the length of the Gardens, appearing in different forms: as contained in a well at the Wellhead – a place of silence and meditation; as a fountain at the Lion’s Head – for collecting drinking water; as a waterfall in Arthur’s Court flowing into the Healing Pool – a pool for foot-bathing and symbolic cleansing; rushing down through the flow-form in the lower gardens collecting in the Vesica Pool – another area of quiet beauty; and from here finally exiting the Gardens via a curving rill across the lower lawns, continuing on its underground way towards the Abbey. In the Gardens there are several Holy Thorn trees, believed to have descended from the original Holy Thorn planted by Joseph of Arimathea. They flower both spring and mid-winter. It is also one of the meeting places of the two powerful ley lines, the Michael and Mary lines – on their way eastwards to the North Sea from the Atlantic Coast in western Cornwall. The Well and its gardens are open all year with shorter hours in the winter. In 2001, it became a designated World Peace Garden. Opening up to the natural world and to its inherent essence of the sacred in a place like Chalice Well, also means participating in the sacred energy exchange, which is at the heart of pilgrimage in Glastonbury.